Wow- I heard there was some crazy weather out there! hmmmmm. sunny California for sure bol…..
Hi Dennis Friend! That looks like a bad time. Dennis… That is exactly how we feel about living in “sunny California”! We currently have a lake at our front door… the kiddlets do no appreciate wadding to go potty! 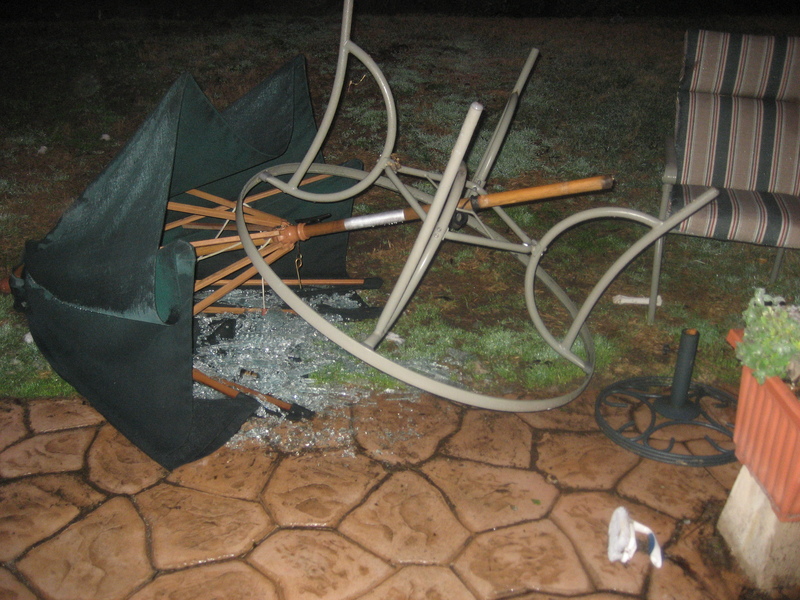 Tired patio set is tired! We have rain and fog but nothing like you have – we heard it is really bad there. It is really strange for us in Kansas to hear about possible tornadic in CA. Stay safe and dry. Hope that you all are staying safe and dry inside!! Yes… we are in So. Cal too. Bad weather… I’m loving it! Thunder and lightning yesterday.. Bodi was barking at the thunder! Our (unreliable at best) weatherman says your storms are coming to Albuquerque on their way to torment the midwest. Try to stay safe and dry. OMD!! Dennis is yoo alright? Did yoo fight dem hedgehoggie fings again?? I wud has been a bit scarit, maybe even pooped myself a bit!! People with glass-topped tables should remove umbrella before storm! Hi Dennis! Please be careful out there! We heard about your terrible weather! Stay dry or you can all come to Hawaii and stay with me! It’s nice and sunny today! This made me laugh, as I was expected some idyllic pic — what went through, a tornado? Looks like something that would happen in our neck of the woods, not yours! Looks familiar. We are getting it up here too, We have grass seed spilled and blown all over the patio, hope it doesn’t germinate. Oh Dennis, looks like you wont be sitting out with a cocktail at the patio table then! Whoa! Rain did that? At least you can’t blame the dogs or Trouble! I remember hail in Venice when I was a kid. Wind was not a usual part of southern cal, except in the passes. I remember moving mom to Joplin, MO, back in 1999. She’d call me all the time, freaking out over the weather, wondering why it didn’t bother me. I kept telling her forty to fifty MPH winds were normal there. I don’t think she ever got used to it: she was a cal native. Oh rain… how we HATE IT! Don’t forget to walk between the raindrops. Well, at least it isn’t burried under 6 feet of snow …..
i have friends in Long Beach . They said that the weather has been pretty bad over the last few days. well, atleast you’re getting some rain..
That will be a mess to clean up! I always get so worried about broken glass around the dogs! Hey were are going to be evacuated again! Checking in from Sierra Mudre! Heard things are getting gross again out your way…. hope everyone stays safe! Oh my! Hope all are safe. Keep tender paws away from that broken glass. This smells like the work of Dobermans, or their evil Cat henchmen. We got our share of rain here today, too, but ours was frozen! I suppose that’s why Mom’s knee is now about the size of a grapefruit. At least she kept Lilac and the rest of us from falling, although I did here some muttered words under her breath about us going out one at a time until the ice is gone. Stay safe and dry! Hopefully you have a good basement to hang out in! Now that’s one hell of a destruction! First thought was DENNIS! Glad to hear it was the weather. You should see our back yard, and our garages, and, and…burn area, ugh! Let’s hope we don’t have any casualties. I must admit though, most people from my area are animal lovers and at least I can have faith our furiends will be properly taken care of. Rut roh Dennis… did I do that? I don’t know how to stop after flyball! That miss Khyra beastie made me do it.! She tripped me! Oh my.. what happened there? That looks familiar! More rain tomorrow they say. Funny, your title was the same as mine today. Stay dry and don’t get blown away. PS: you can always come over here – 35 degrees and endless sunshine! i’m just glad we axed all the nearby tan oaks! yup, you and i live in same part of the country it seems! Wooow.Really bad weather.I hope that everyone its ok there. Oh my dog! Did you guys get a hurricane? Typhoon? Landslide?